The boxing world is both shocked and saddened today at the death of former super-bantamweight contender and world title challenger Alejandro Gonzalez Junior. The 23 year old was murdered not far from his home in Guadalajara, Mexico on Friday. Reports say Gonzalez and two other people were “executed” gangland style and were found in a truck. “Just hearing the tragic news about Alejandro Gonzalez Jr. RIP Champ,” Frampton also wrote on his official Twitter page today. 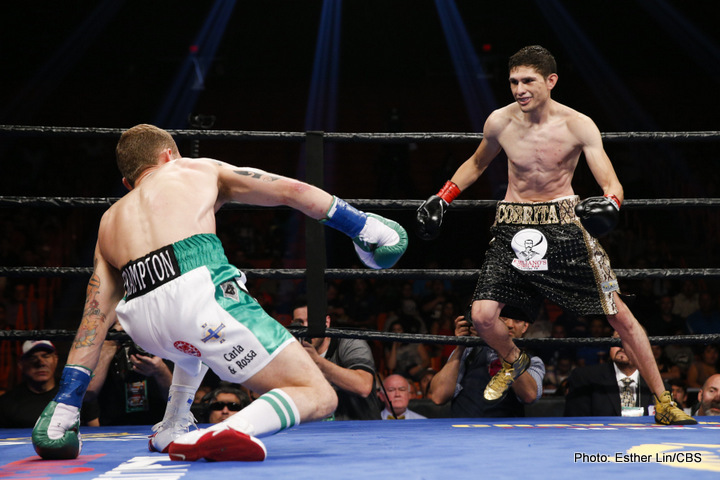 Back in July’s fight of last year, Gonzalez shocked Frampton by knocking him down twice in the early going of the super-bantamweight title fight in El Paso. Frampton had to dig deep so as to keep his belt and unbeaten record, eventually winning via unanimous decision. The two fighters had plenty of respect for one another then and Frampton’s touching Tweet makes it clear he had affection for the Mexican who he called “a real warrior.” Gonzalez turned pro in March of 2010, picking up a draw in his home town. After the debut, Gonzalez won all but two of his bouts going into the Frampton shot, dropping a technical decision and boxing to another draw. In his last two outings, in November of last year and in October of this year, the 23 year old was out-pointed and then held to yet another draw. It is hoped the people responsible for these horrific murders will be brought to justice as swiftly as is possible.